It can happen to us all, whether, at home or work, drains sometimes get blocked. There can be any number of reasons why a drain has blocked or clogged. 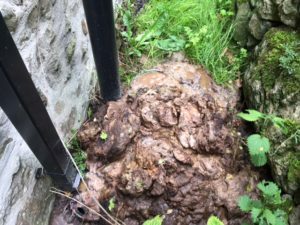 It could be what you are trying to flush down the toilet that has caused a clogged drain, possibly wipes or sanitary products. It could be a combination of something like grease and fat products. However, no matter what has caused the clogged drain, Brisk Services engineers are equipped to deal with all types of problems. 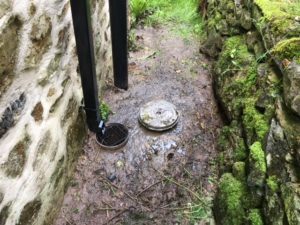 The majority of drains are cleared with conventional drain rodding, however all our service vehicles carry high pressure water jetting units should they be required, they are also equipped with CCTV drain cameras, which if necessary, allow us to check your drains following a blockage. 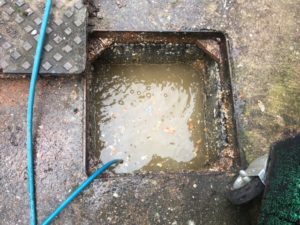 If you are in any doubt about a possible blocked drain or clogged drain, give your local office a call now to arrange a visit from your local drain unblocker. Drag the pointer to see the before and after photos of a particularly unpleasant drain blockage cleared by Brisk Services.